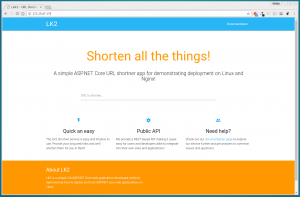 Deploying and hosting ASP.NET Core applications on Ubuntu Linux – Life in apps, os's and code! If you’ve read my other blog posts or seen some of my projects on my GitHub profile, you’ll see that I’m a real Linux fan and although I develop in both PHP and C#, C# based web applications are commonly hosted on the Microsoft Windows platform (although you could use Mono) so for this reason, it has previously made my first choice for developing web applications choosing a technology stack that enabled me to control whether I wanted to host on Windows, Linux, Mac or BSD. Microsoft not so long ago released .NET Core – .NET Core is open-source and supports cross-platform operating systems. 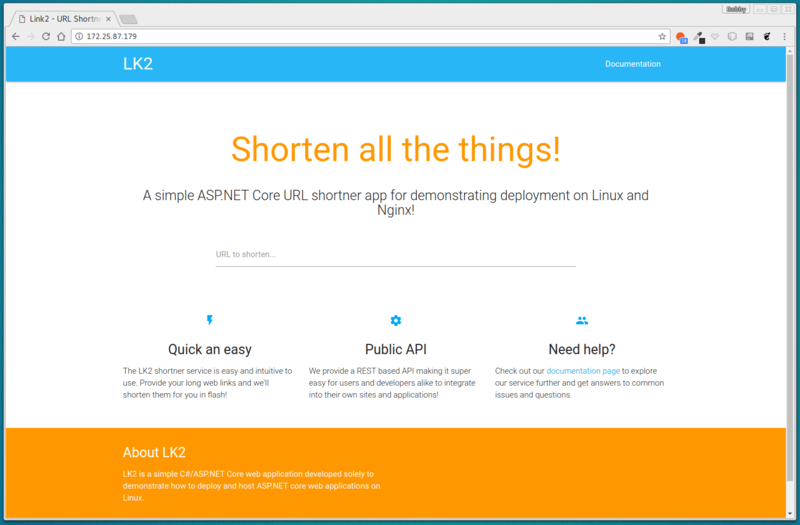 I wanted to make a blog post about how to configure and host a simple (but functional) C#/ASP.NET MVC application on Ubuntu Linux, ror this tutorial I created a very simple, working but fictional URL shortner service. I’ve built this using ASP.NET Core 5 and Entity Framework 6. Source code available here. In this tutorial we will use the latest stable version of Nginx (from the Nginx PPA) of which will be configured to reverse proxy requests to our application server which will be running Kestrel. 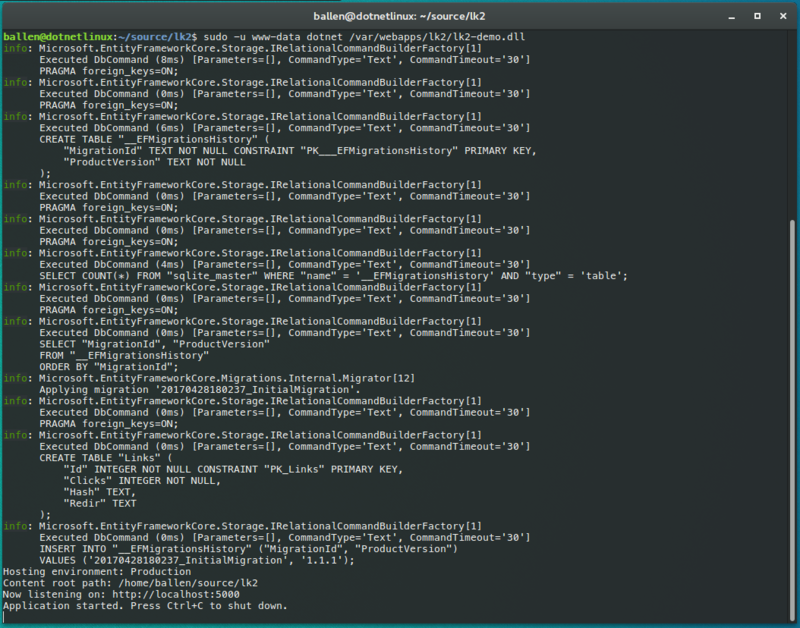 systemd will be used for starting our application server and monitoring the process. This tutorial assumes that you already have a user account setup and has been granted sudo rights. My virtual machine is configured with 2GB of RAM. That’s great, we now have the public repository downloaded to our user home directory under a folder name ‘source’. Further on in this tutorial we will “publish” our application from this directory to our web hosting directory which will then be used to serve the application. We will now add the official Nginx package repository to our server as this will enable us to then download the required packages from the Nginx package repository. Although we’ve downloaded the source code for our application, we need to “publish” it, Publishing a .NET Core application essentially bundles all the required run-time libraries (in the form of DLL’s) and copies across our appsettings.json file as well as any public assets. Our source code contains our application code but also makes references to external libraries, I’ve used NuGet to manage these dependencies. 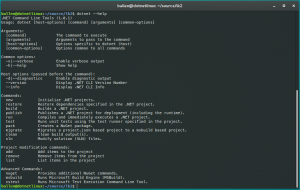 The above command states that we want to build our project for “Production” and we have specified the output path as /var/webapps/lk2. Running the above command you will see the following output, as you can see our Entity Framework database migrations have been run automatically for us (and we now have a SQLite database that has been created under /var/webapps/lk2). 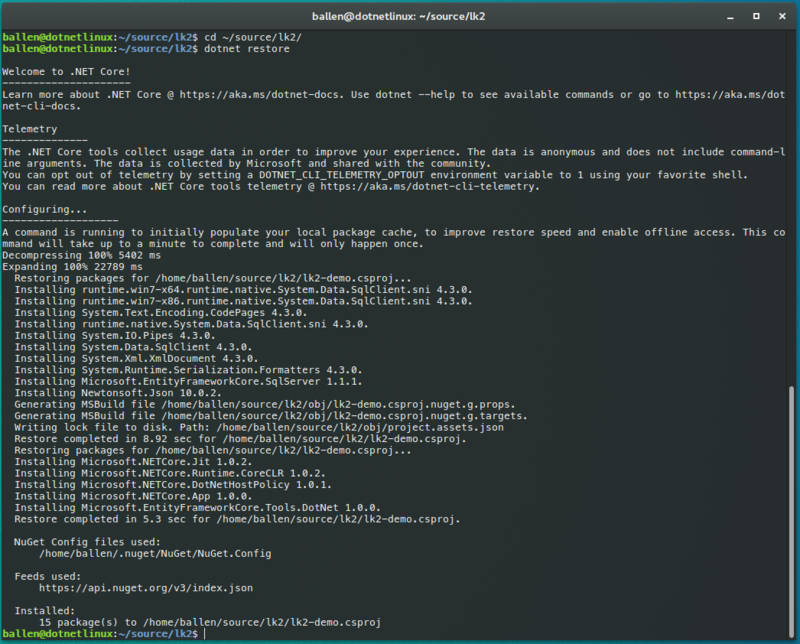 You could also use Microsoft SQL Server if you wanted, you’d simply need to edit the appsettings.json file found in /var/webapps/lk2 and change the driver to mssql and set the corresponding connection string. 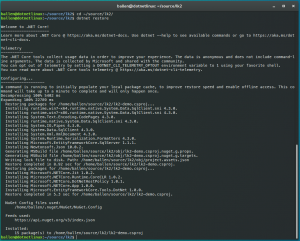 You could also check out my recent blog post about installing and use Microsoft SQL Server on Linux. Great, now save the file! 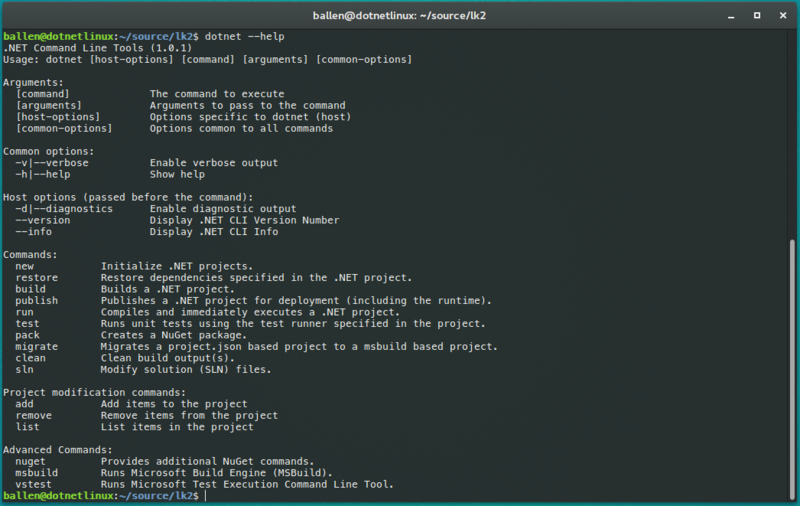 In future, when you have made source changes you would need to commit those to Git, then change into the source code directory (cd ~/source/lk2), pull the latest changes (git pull) and the re-run the publish command. 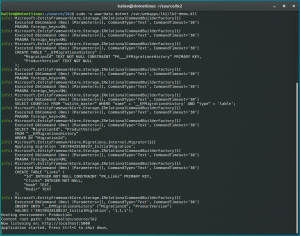 Once the latest source has been built you would then need to restart the application service by running (sudo systemctl reload lk2.service).